The Chinese Communist Party‘s newspaper reported, accurately, that The Onion has named North Korea‘s Leader the Sexiest Man Alive. The word satire was notably absent from the report. 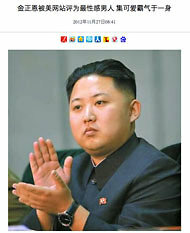 A state-run newspaper in China reported, accurately, that The Onion has named North Korea’s leader its Sexiest Man Alive for 2012. Left unsaid in the report, which was featured on the English-language home page of People’s Daily Online on Tuesday, is whether the editors of the Chinese Communist Party’s newspaper are in on the joke that the American publication is, well, kidding. A screenshot from People’s Daily Online on Tuesday. Although the People’s Daily report, accompanied by a 55-photograph slide show, clearly cited The Onion, there was no reference in either English or Chinese to the fact that the original item was satirical. An entirely accurate summary of a report from The Onion by the Chinese Communist Party’s newspaper. “With his devastatingly handsome, round face, his boyish charm, and his strong, sturdy frame, this Pyongyang-bred heartthrob is every woman’s dream come true. Blessed with an air of power that masks an unmistakable cute, cuddly side, Kim made this newspaper’s editorial board swoon with his impeccable fashion sense, chic short hairstyle, and, of course, that famous smile,” it said. The Associated Press tried and failed to reach the editors of People’s Daily for comment late on Tuesday in Beijing. Regular readers of The Lede will be aware that this is not the first time The Onion has been apparently mistaken for a news organization by journalists. In September, Iran’s Fars News Agency plagiarized The Onion, running an edited version of a satirical report as if it were real, and then defended itself by claiming that the fake news item had uncovered a deeper truth. A screenshot of the People’s Daily home page on Tuesday. As The Lede suggested in September, the increasingly lighthearted tone in the reports of many serious news organizations, as they compete for attention on social networks in the Internet era, could be making such mistakes more common. 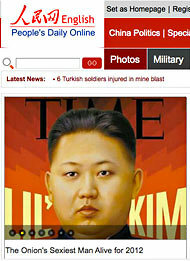 The image of North Korea’s leader featured on the People’s Daily home page on Tuesday, for instance, was taken from a recent Time magazine cover that referred to him as “Lil’ Kim,” playing on a joke frequently made by bloggers who use the name of a female rapper to refer to the young leader. Robert Mackey also remixes the news on Twitter @robertmackey.